As announced, a total of 4,404 out of 30,231 (14.57%) examinees passed the PNP Entrance Exams while out of 5,554 who took the PO Exam, 2,336 (42.06%) passed and 3,037 (41.36%) of the 7,343 examinees passed the SPO Exam. Results of the Police Inspector and Superintendent exams are to follow. The PNP entrance and promotional exams are administered by the National Police Commission (NAPOLCOM) on April 22, 2018 at NAPOLCOM testing locations in the cities of Makati, Angeles (Pampanga), San Fernando (La Union), Baguio, Tuguegarao, Calapan, Cabuyao, Legazpi, Bacolod, Iloilo, Tacloban, Cebu, Calbayog, Mati (Davao), Cagayan de Oro, Davao, Pagadian, Koronadal, Zamboanga, Butuan, Cotabato, and in the province of Tawi-Tawi (ARMM). According to NAPOLCOM, notification of results for April 2018 NAPOLCOM Entrance and Promotional Exams will be posted at NAPOLCOM Central Office located at DILG-NAPOLCOM Center, NAPOLCOM Building, EDSA corner Quezon Avenue, West Triangle Quezon City 1104 or at NAPOLCOM official website. UPDATE: Results are expected to be released anytime by June to July 2018. On the most recent exams conducted by NAPOLCOM on October 2017, 5,236 out of 28,654 (18.27%) passed the entrance exams while 419 out of 1,253 (33.44%) hurdled the promotional tests. On April 2017, 2,026 or 7.63% out of the 26,561 examinees passed the Philippine National Police (PNP) Entrance exams while 5,610 or 35.59% out of 15,763 combined examinees hurdled the promotional exams. Meanwhile, below is the statistics of NAPOLCOM results in the last five (5) exams, courtesy of NAPOLCOM. 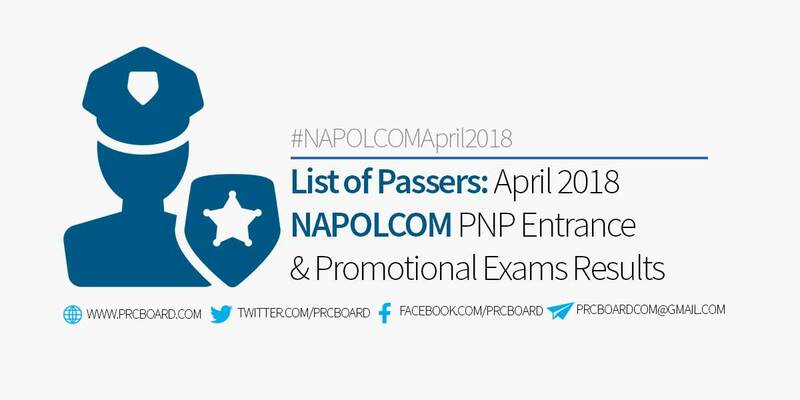 To receive up-to-date news about April 2018 NAPOLCOM exam results, we advise our visitors to visit NAPOLCOM official website, bookmark this page or follow us at our social media pages via Facebook and Twitter. Paano ho makita yong pangalan ng mga passers? Bakit wala ung Laguna sa testing location? God kaw na bahala. we hope na makapasa kami and by faith. Kelan po ipopost ung result?? para sa future, Pasado na tayo! lalabaz dn yan... antay lng..
makita ko lang pangalan mo dito... solve na ako..
kalian po lalabas ang result? dati 2months after the exam, ngAun 3months na nakalagay. Patagal ng patagal ah. may result na poh ba?